Valerie Barr is a Professor in the Computer Science department at Union College, Schenectady, NY. She received her undergraduate degree in Applied Mathematics from Mount Holyoke College, her M.S. in Computer Science from New York University, and her Ph.D. in Computer Science from Rutgers University. Between receiving her Masters and Ph.D., Valerie worked in industry on applications such as automated blood analyzers, automated storage and retrieval machines, and banking back office operations. One area of research is software testing, focused on the development of verification and validation methods for natural language processing systems. Her research has also focused on a number of big data projects with colleagues in departments as disparate as English, Economics, and Political Science. 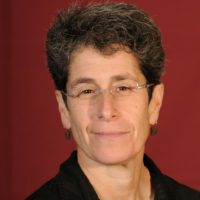 She is also involved in curriculum development, chiefly through the creation of interdisciplinary programs between CS and the humanities, sciences, and social sciences, with a goal of changing the demographics of and increasing enrollments in computer science. Valerie has also been the recipient of NSF POWRE and CPATH awards. She is currently chair of ACM-W, the Association for Computing Machinery Council on Women in Computing.